Yesterday we saw Crude jump almost 2% on a weaker dollar and speculations about Russia and OPEC’s upcoming meeting. Today more fuel was added to the fire (no pun intended) and we saw Crude continue to jump, settling out up an additional 4.9% to $48.53/bbl. Going along for the ride, ULSD closed up (+.0632) to 1.6115 and RBOB jumped (+.0509) to 1.4362. Primarily Russia and their proposed meeting with the Saudi’s on energy projects and outlooks, as discussed yesterday. (for a quick refresher, read this: Russia, OPEC and a Weaker Dollar - Oh My!). Interestingly, before the meeting news broke on Monday, the Saudi’s had abruptly announced they would be slashing the price of their oil exports to retain market share – not a good sign for the global economy (demand), or the global supply situation. But the signal that OPEC may be willing to talk, specifically that the Saudi’s are, has more than eliminated any pull back the price cut could have been expected to have. Additionally, the Baker Hughes rig count report indicated further drops (down an additional 29), causing Goldman Sachs to project that US production will drop by 225,000 barrels per day in 2016. Reuters is also reporting that Libya’s production has fallen below 25% of the levels it sustained prior to the ouster of Ghaddafi. Its possible traders are seeing at least a slow-down in the growth of the oil glut on the heels of these news items, reading it as a bullish signal for prices, and acting accordingly. There is rumor of a Chinese stimulus attempt as well, aimed at ramping up economic growth in that country, and therefore oil demand. As we’ve discussed before, news out of China is almost always a big driver of market moves, as they’re still the “hail Mary pass” on global economic recovery everyone is holding out for. Positive news from China = Positive numbers on the screen. Keep in mind - the tense standoff between the US and Russia in Syria may become an increasing factor over time. Yesterday the Russians violated Turkish airspace, and we’ll have to see if there’s more sabre rattling from the Russians, or equally likely, hawkish overreaction by the US or NATO. A few days away from the "official" start of the driving season saw gas prices tumble.... Or at least that what the news outlets will be saying. Futures corrected today as the DOE report showed a strong 3mbl build while the Trade expected 1m gallon draw. Distillates and Crude were somewhat bearish showing draws of 1.1mbl and 338k respectively. Losses could have been much steeper, but selling appeared to be tempered by the fact that most believe the FED will continue stimulus measures until a clear sign of economic improvements. The assumption is that should the FED start to pull back their measures, it could cause a significant sell off as people get rid of long positions. HEAT still seems content be range bound between 3.10 and 2.75, with a tighter range of 2.85 to 2.95. At the close, Crude fell $1.90 to $94.28, RBOB lost .0264 to $2.8194 and HEAT took the brunt of the hit dropping .0554 to $2.8736, which is surprising since the builds were seen in Gas. After last nights API data release that showed Crude suffering a massive 11.2 mbl draw, most were awaiting todays DOE numbers with one eye closed, hoping it was an aberration. For those watching the screens at precisely 10:30 this morning you saw Rbob spike 4 cents and HO jump 3. While not as horrific as an 11 million barrel draw, Crude still lost 6.5mbl according to the DOE. Gasolines fell 2.2mbl and distillates fell 974k. Still, far more than expectations. Other Bullish influences to the Market early were the Federal Reserve meetings that many had been betting on another round of stimulus. That gamble didn't pay off as a short time ago they announced that while the economic turn around has slowed, it doesn't warrant another round of stimulus... yet. 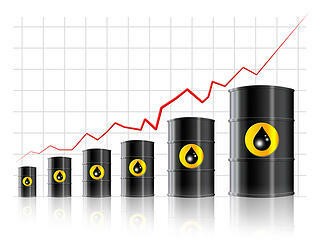 The interesting note to the entire session is that Crude, at its peak today, was only up $1.50. In the last half hour of the trade, HO looked to be going negative as the air was let out of the balloon. RBOB inflated to much to peel off any of the gains and finished up .0599 to $2.8342, HO gained .0108 to 2.8588 and Crude added .85 to $88.91. Thursday sets up to be another exciting day with Jobless figures due out at 8:30.